Growing urbanization has resulted into increased generation of Municipal Solid Waste (MSW) which needs to be managed by adopting environmentally sustainable technologies so as to keep our cities clean and protect the environment. Use of landfills may not be sustainable as it requires land which is scarce and also associated with a potential risk of surface and groundwater pollution due to leachate generation and deteriorated ambient air quality due to bad odour, flies, methane emission, fires etc. There is also a growing need to minimize the cost of managing MSW through recovery of resources and energy instead of disposal into landfill. Giving utmost importance to the Municipal Solid Waste Management, the Central Pollution Control Board (CPCB) celebrated the occasion of World Environment Day at Ghazipur Landfill Site in Delhi, in collaboration with East Delhi Municipal Corporation, Infrastructure Leasing & Financial Services(IL&FS) and GAIL (India) Limited. The latter are managing the Ghazipur Landfill site, commissioning of Waste-to-Energy plant and operating a pilot project on landfill gas management respectively. About 100 scientists from the CPCB, along with Dr. A. B. Akolkar, Member Secretary, CPCB gathered at the Ghazipur landfill site at 8 AM in the morning. The scientists held technical sessions with EDMC, IL&FS and GAIL (India) Ltd and also made site visits to the Landfill, facilities of the Waste-to-Energy Plant and Landfill Gas Management. Delhi generates about 8,300 metric tons of municipal solid waste per day and landfill sites at Bhalsawa, Okhla Phase-I and Ghazipur are used for disposal. A Waste-to-Energy plant is also operational at old NDMC Compost Plant, Okhla, processing about 1500-2000 metric tons of waste per day to produce about 16 MW of electricity. 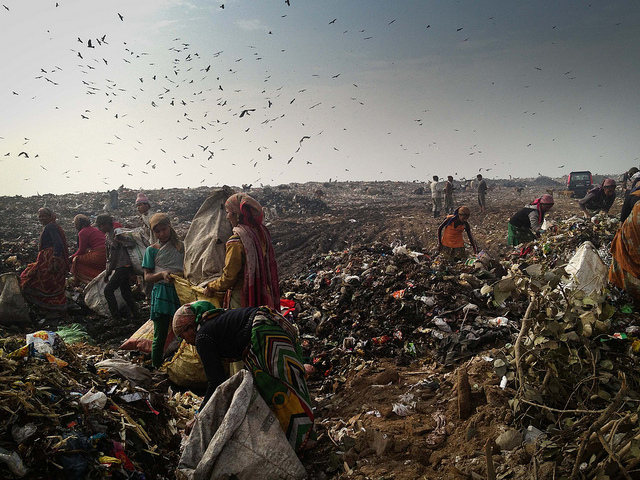 About one lakh tons of mixed solid waste is disposed at Ghazipur landfill per month. Average landfill gas collection, comprising methane (28% by volume), is about 127 cu. meter/hour which is being flared at the site by GAIL (India) Ltd.
IL&FS is in process of commissioning a Waste-to-Energy plant to process about 2,000 tons of municipal solid waste per day to produce Reduce Derived Fuel (RDF) and generation of 12 MW of electricity thereof. The plant is at final stage of commissioning and expected to operate within a month.